All basils make tasty flowers, but African Blue Basil's flowers are pink with a dark purple calyx instead of the usual white flower with a green calyx found on most Basils, making them attractive, and tasty, for salads, drinks or garnishes. Because African Blue Basil is sterile and never makes a seed, flower stems are longer, up to 18 inches, and bloom time is until frost. Individual flowers can be plucked from the stem or whole stem segments can be used for a dramatic addition to a culinary bouquet. Add African Blue Basil Flowers to sour cream for baked potatoes, top your favorite pasta dish with them or float them in ice trays and add to ginger ale, champagne or white wine spritzers. African Blue Basil is more suited to indoor growing than most basils. If you want to over winter the plant, either grow it through the summer in a pot and move it in before frost or grow it in the ground and take tip cuttings in early fall. These are easily started in a glass of water (change the water every day) and then transferred to a pot for the winter. Basils do not dry well, but leaves and flowers can be pureed with olive oil and frozen for winter use. Use about 3 cups leaves to 1/3 cup olive oil and store flat in small resealable bags. 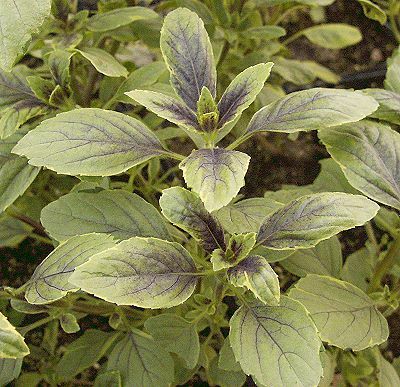 African Blue Basil is one of the six plants chosen to be in our Edible Flower Herb Garden Six Pack. This plant is often available in plug trays. These trays hold 128 of all the same plant. They are a great low cost way to fill a lot of space. Each cell is 3/4 of inch by an inch. Check here to see if African Blue Basil Plug Trays are available.